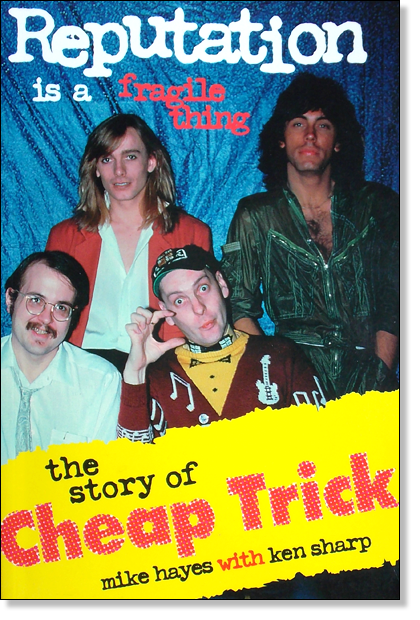 Out of print for almost 20 years, the acclaimed biography Reputation Is A Fragile Thing: The Story of Cheap Trick is back! After years of demand from fans who missed out on purchasing the book when first published and to combat inflated prices on eBay where the book routinely sells for an excess of one hundred dollars, the book is available now for a short time in an extremely limited reprint run. With such classic songs as “Surrender,” “I Want You To Want Me” and “Dream Police,” Cheap Trick captured the ears of the world with their apocalyptic brand of super-charged melodic rock and electrifying lie performances. Written by Mike Hayes with Ken Sharp, Reputation Is A Fragile Thing: The Story of Cheap Trick chronicles the colorful, topsy-turvy career of rock’s hardest working band. Featuring a foreword by Roy Wood of the Move, the book is illustrated with over 175 photos—many never-before-seen—and rare memorabilia, the book contains a comprehensive band history, charting their evolution through such pre-Trick outfits as Fuse, Sick Man of Europe and The Paegans. A Complete U.S. discography and core set list spanning 1973 to 1997 round out this definitive portrait of a rock and roll cartoon come to life. This is the story of Cheap Trick. *Please note: The book is a straight reprint of the original edition and is not an updated version.